As always, this recipe is healthy for you and diabetic friendly. Your friends and family will love it. Let me know if you try it. Preheat the oven to 325 degrees F. Coat a square baking dish with cooking spray. Remove the stems from the mushrooms and chop them finely. Set aside the stems. Place the mushroom caps in a bowl and toss them with 1 teaspoon olive oil and balsamic vinegar. Set aside the caps. Heat the remaining teaspoon olive oil in a medium skillet over medium heat. Add the onion, green pepper, and mushroom stems and sauté for 3 minutes. Add the sausage and cook for another 8 to 10 minutes, stirring frequently, until the sausage is completely browned. Add the bread crumbs, stirring to combine evenly with all the other ingredients. Stir in the mozzarella cheese and melt. Fill each mushroom generously with the sausage mixture (about 1 heaping tablespoon per mushroom cap). 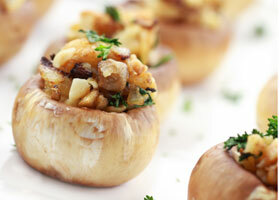 Arrange the mushrooms in the baking dish and bake 40 minutes or until the stuffing is crispy on the top. MAKE IT GLUTEN-FREE: Confirm all ingredients, including turkey breakfast sausage, are gluten-free. If you don’t have gluten-free bread crumbs you can make your own or try using cornmeal.